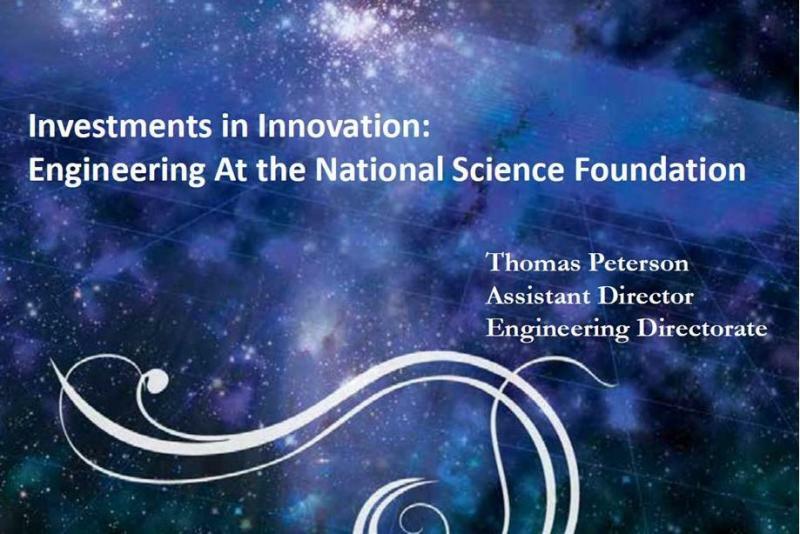 On May 9, 2012, the Office of Research and The Henry Samueli School of Engineering hosted a seminar by Dr. Thomas W. Peterson, Ph.D., to present the investments in innovations by the NSF Engineering (ENG) Directorate. The ENG Directorate at NSF provides critical support for the nation's engineering research and education activities, and is a driving force behind the education and development of the nation's engineering workforce. With a budget of approximately $640 million, the directorate supports fundamental and transformative research, the creation of cutting-edge facilities and tools, broad interdisciplinary collaborations, and through its centers and Small Business Innovation Research programs, enhances the competitiveness of U.S. companies. Prior to joining NSF, Peterson was the Dean of the College of Engineering at the University of Arizona. He received his B.S. from Tufts University, his M.S. from the University of Arizona and his Ph.D. from the California Institute of Technology, all in chemical engineering. He has served on the faculty of the University of Arizona since 1977, as head of the chemical and environmental engineering department from 1990 to 1998, and as dean from 1998 until January 2009.